The Dupree Dream Open Studio Event, On April 26th, 2014, Dupree Studios opened its doors to show the public what the City of Philadelphia plans to tear down in the name of “revitalization”. Dupree wants to inform fellow citizens about the unconstitutional seizure of his inspiring and unique property. He also wanted to share this creative space with others, while the opportunity still stands. The event had guest speakers throughout the day, eminent domain and art discussions, musical acts, DJs, live art, spin art for kids, a book signing, and… live interview! 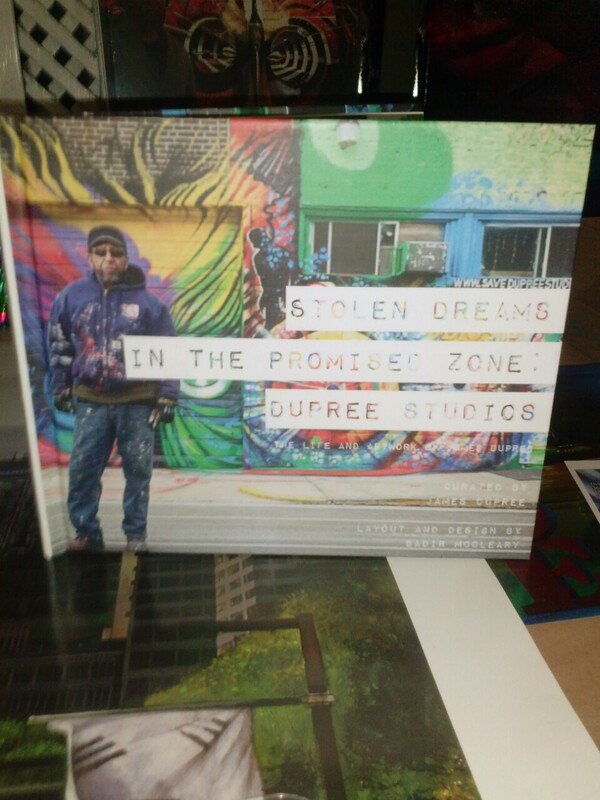 On this day Mr. Dupree released his self titled book ‘ Stolen Dreams In The Promised Zone: Dupree Studios’ curated by James Dupree himself with layout and design done by one of my dear friends Badir McCleary of ‘Art Above Reality’. The book entails Mr. Dupree’s life’s journey of becoming an entrepreneur all while giving back to the community, the building of his art gallery and studio and his expressive artwork of eminent domain. Unfortunately I couldn’t make it to enjoy the all the event had to offer on that day but I did however manage to make it in time to see some of my favorite men who I consider family ‘Hazie Blu’ to perform and take my own little mini tour of Dupree Studios. It was an honor and pleasure to not only meet Mr. Dupree but to work with him as well. I know very little about the art world but I as always I’m interested in all forms of artistic expression be it music, dance and even art in its many forms. Yours truly was given the opportunity to not only support Mr. Dupree in his efforts to ‘ Save Dupree Studios’ he also gave me the opportunity to be featured and published as well. 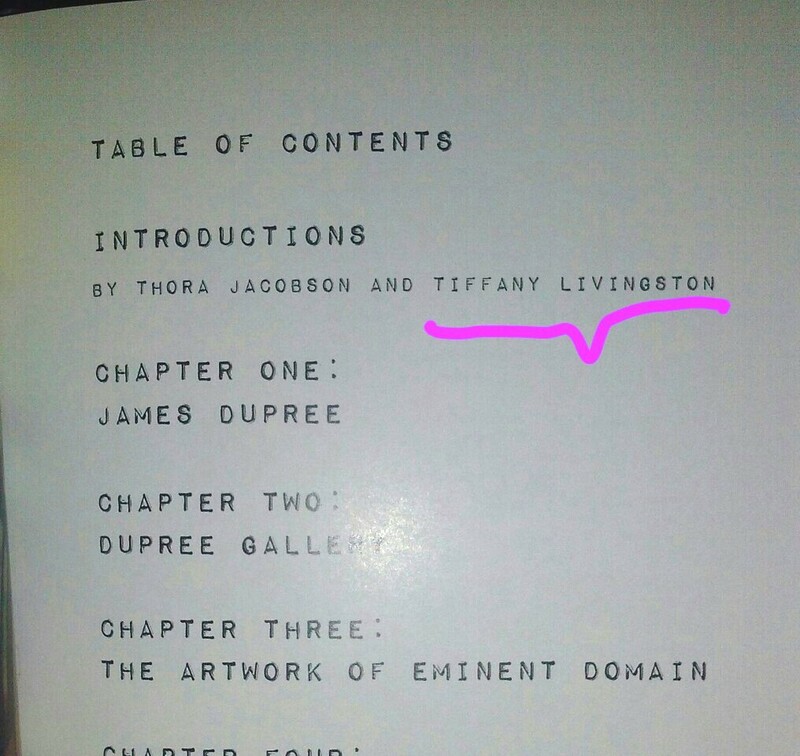 I didn’t know how to feel but I was filled with the joy of accomplishment when I opened the book to see my name in the ‘Table of Contents’ . 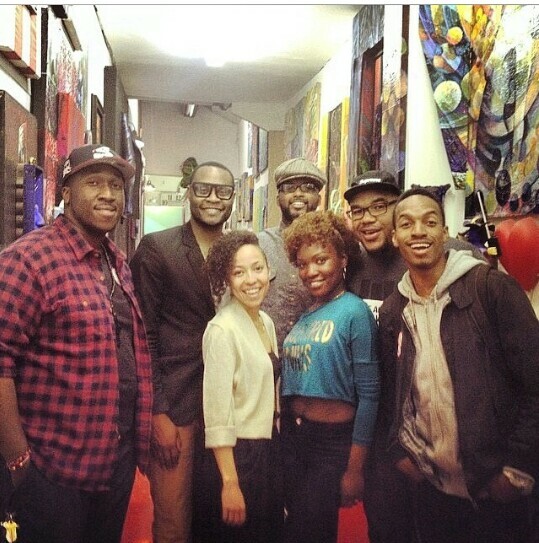 Not only did I get to share my writings but I also got the chance to be apart of something bigger than myself. I got the chance to meet a man who had so much audacity and faith in his craft that he’s willing to fight for it. And just to think that all I did was share my opinion on the matter, I didn’t know that I would actually become apart of the fight for The Dupree Dream.